As Mazda's largest and most powerful SUV, the 2018 CX-9 is also one of the industry's most appealing 3-row crossover SUVs. The CX-9's styling is more seductive than popular brands such as the Honda Pilot and Toyota Highlander. And though it lacks the same interior space and towing abilities of its larger rivals, the CX-9's ride and handling are far superior. If your enthusiast-driving side is now in direct conflict with your growing family's transportation needs, the 2018 Mazda CX-9 offers the best of both worlds. From its stunning styling to its near-luxury-like interior, the CX-9 is as impressive to stare at as it is to drive. With seating limited to seven, the CX-9 isn't the largest or most space-efficient family SUV one can buy. Tech fans won't be happy with the lack of Apple CarPlay and Android Auto, and those who need maximum towing ability will be better served by an a SUV with a V6 or V8. Mazda's 2018 CX-9 sees a number of improvements, starting with making Smart City Brake Support, rear cross-traffic alert and blind-spot monitoring standard on every vehicle. A revised 2nd-row seat, G-Vectoring Control and additional standard equipment for the Sport and Touring trims round out the changes of note. All Mazda CX-9s have 3-row, 7-passenger seating. Adults fit fine in the second row, but the third row is best for kids. The front seats are roomy, and the area feels commanding thanks to a wide console. Nestled in that console is a rotary dial and auxiliary buttons controlling the CX-9's standard dash-mounted infotainment display. The view out front is good, and we like that the left windowsill is wide enough to rest an arm. The new CX-9 trails the Honda Pilot and Toyota Highlander in cargo room, but there's a respectable 71.2 cubic feet with the second and third rows folded. If you're looking for a bit of elegance in your next family hauler, the CX-9 has it in spades. Dressed in Mazda's "Soul of Motion" design philosophy, the CX-9's sheet metal emphasizes sweeping forms, organic shapes and the idea of movement even at rest. We think it's beautiful. That big grille up front adds to the premium cred, yet doesn't seem overboard. The tapering roof and forward stance make this SUV appear smaller than it is, and even its rear is pretty thanks to a horizontal treatment of the taillights and rear lip beneath the window. A pair of exhaust outlets further emphasizes this SUV's sporty nature. Mazda vehicles have always had a way of making a big splash on a tight budget, and the 2018 CX-9 is no exception. Offering superior ride and handling versus better-known rivals has always been the CX-9's trump card, but now it's backed by a stunning interior placing it in the same league as some premium luxury brands. Despite its size, the CX-9 feels amazingly light on its feet, with responsive steering and a suspension that begs to be pushed hard, especially when the road begins to twist and turn. Although the CX-9's turbocharged 4-cylinder isn't the most powerful engine in its class, its 310 lb-ft of torque are more than sufficient to rapidly move this SUV when needed. Mazda's G-Vectoring Control minutely reduces torque, thus shifting more weight to the front wheels, which improves steering feel and traction. And while the CX-9's ride is firmer than that of the Honda Pilot or Kia Sorento, it is far from harsh. The 2018 Mazda CX-9 has a Manufacturer's Suggested Retail Price (MSRP) of $33,070 for a base model. Touring trims bow at $35,900, and Grand Touring models start at $41,410. Adding AWD is an extra $1,800. The top-line Signature model that includes AWD standard starts at $45,255. At these prices, the new CX-9 begins slightly higher than rivals like the Highlander, Pilot, Traverse, GMC Acadia and Kia Sorento. But the price-to-features differential evens out or leans in the Mazda's favor as you climb trims. If you're simply looking for a low-priced 3-row SUV, there's the Mitsubishi Outlander, though that isn't as easy to recommend. Even harder, but it still exists, is the Dodge Journey. Before buying, be sure to check the KBB.com Fair Purchase Price to see what others are paying for their new SUV. The Mazda CX-9's resale value is expected to hold up well, though still trail the Highlander and Pilot. The 2018 Mazda CX-9 remains available in four trims: Sport, Touring, Grand Touring and Signature. Even the base Sport model offers amenities like 3-zone climate control that includes a 2nd-row control panel, 7-inch color touch-screen display with rotary controller, Smart City Brake Support (active at speeds up to 19 mph), blind-spot monitor, rear cross-traffic alert, a rearview camera and 18-inch wheels. However, unless you opt for a package, you'll still have to manually adjust the front seats. Standard tech features include the Mazda Connect system with voice command, Internet radio streaming, Bluetooth connectivity, and AM/FM/HD Radio with an auxiliary input and two USB inputs. Sorry, CD fans -- a compact-disc player isn't even optional. We recommend at least the Touring trim, which includes heated and power-operated front seats, leather trim, power liftgate with adjustable height setting, a larger 8-inch command screen and four USB ports. The Touring trim also comes with a significant active-safety system: Smart City Brake Support (optional on the Sport). Grand Touring trims include navigation, 12-speaker Bose audio, a moonroof and more safety/driving aids such as radar cruise control, backup sensors and lane-keeping assist (optional on other trims). Signature models have all-wheel drive standard, Nappa leather trim, rosewood accents and LED accent lighting in the grille. Many of the Touring and Grand Touring features are optional in packages on the Sport and Touring trims. The 2018 Mazda CX-9 blurs the lines between family vehicle and luxury cruiser. The top-of-the-line Signature trim features real rosewood accents and Nappa leather seating with styling that could just as easily have come from the studios at Audi, Mercedes-Benz or Lexus. Mazda's SkyActiv-G turbocharged 4-cylinder engine isn't the most powerful in this class, but its ability to generate 310 lb-ft of torque while simultaneously achieving 28 mpg on the highway makes it one of the most efficient. The 2018 Mazda CX-9 uses a small but potent 2.5-liter turbocharged 4-cylinder good for 227 horsepower and a whopping 310 lb-ft of torque. That low-end torque, combined with sophisticated plumbing for the turbo system, makes this engine feel plenty strong, like a V6 in disguise. You'll see two horsepower figures: 250 is the max, running on harder-to-find 93 octane. Most drivers will opt for regular unleaded, on which the engine makes 227 horsepower. Front-wheel drive (FWD) is the standard setup, with all-wheel drive (AWD) optional and recommended if you live in a cold-weather state. All models use a 6-speed automatic transmission. The CX-9's towing capacity is 3,500 pounds, less than the 5,000-pound figure put up by the Highlander and Pilot, or the 7,400 figure of the Durango with the V8 engine. As Mazda's largest and most powerful SUV, the 2018 CX-9 is also one of the industry's most appealing 3-row family crossover SUVs. The CX-9's styling is more seductive than better-known rivals like the Honda Pilot and Toyota Highlander, and its interior is more alluring than some luxury brands. But, it's the way the 2018 Mazda CX-9 drives that makes it such a standout, with a light but rigid body and advanced features such as Mazda's G-Vectoring technology that help improve the CX-9's cornering ability. The CX-9's turbocharged 4-cylinder engine is unique in this segment, offering good power and fuel economy, but a limited 3,500-pound tow rating. Being on the smaller side, the CX-9 does offer less interior room than the Ford Explorer or Chevrolet Traverse. 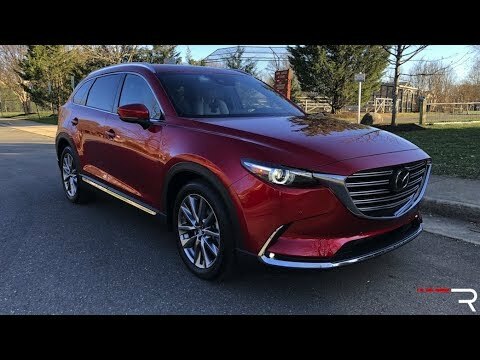 2018 Mazda cx-9-wonderful 3rd row seating and awesome ride!! I love my cx-9. It gets great gas mileage for a full size SUV. It rides smooth almost like the car drives itself. I love the added sensors because they make highway driving so easy! Lots of safety feathers. The surround sound Bose system sounds great also. I have not had to use this in the snow yet but I think I will like it, we will see. I do wish it had a digital speedometer but I have gotten use to the needle again. A very reliable and attractive vehicle. The cx-9 is very comfortable to drive and performs well. . . Especially in sport mode. I like the option of using this mode for better pick-up. It is very roomy. . Seats 7 comfortably but can fit 8 in a pinch. The gas mileage is acceptable. I fill up once a week and drive a minimum of 50 miles a day. I would recommend this vehicle as an alternative to higher end SUVs. The Mazda cx-9 has a very smooth ride without a lot of excess noise. The amenities offered in the vehicle are great, particularly the USB ports and the individual a/c controls that offered in the second row seats. I wish that the air vents on the dash were positioned in a different place to offer better air flow. Overall, this is a great vehicle.